While I was heading to the ninth floor to pick up the spleen (see previous post), it stopped on the third and I was kicked out of the elevator by a team of doctors and nurses wheeling some really fucked up, anesthetized guy on an operating bed. I was all, "going up?" and they asked me to step out. Then they used some kind of special key card to clear all of the pressed floors. The elevators at this hospital are among the slowest in the city. 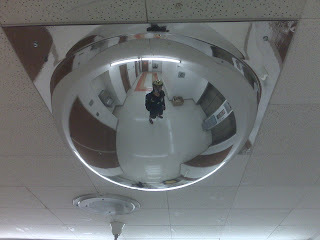 This mirror kept me entertained for a while. I want to get one of those key cards.